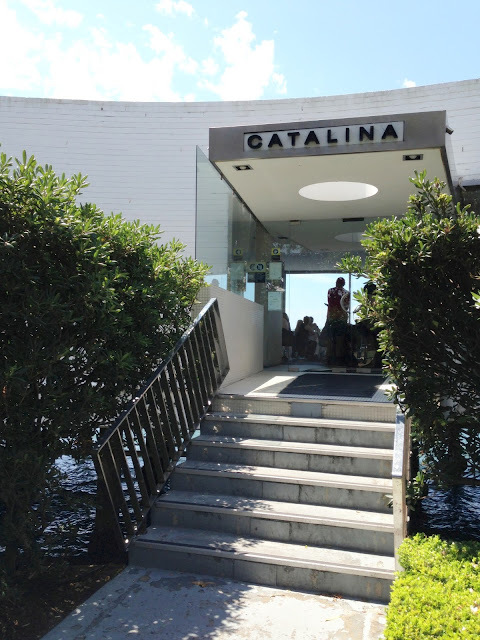 Every year I always get super excited for Christmas Eve and on the 24th December 2012, it was extra special as M & I celebrated the occasion at the beautiful Catalina restaurant. 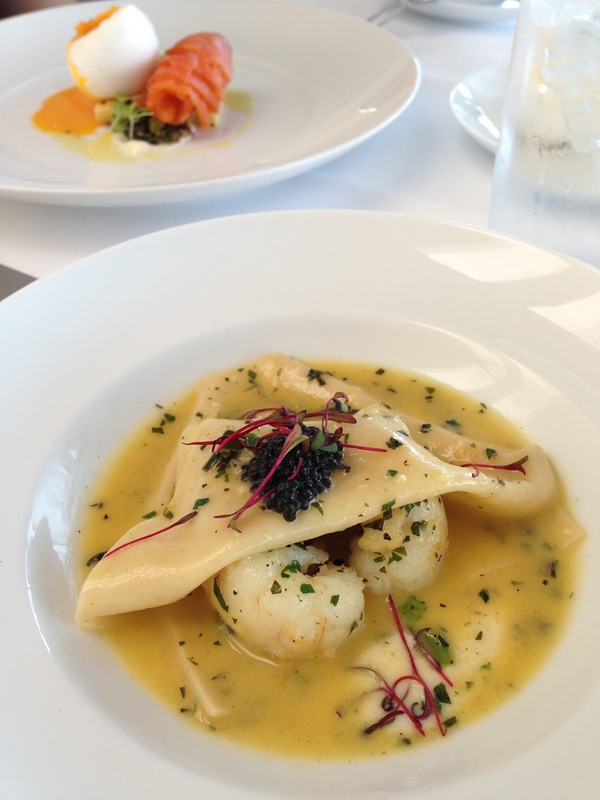 We had an exquisite 3 course meal against a stunning backdrop of Sydney's landmark Rose Bay site with clear blue skies and glistening waters to match - we couldn't have asked for a more perfect finish to the year. How could you not fall in love with this place? I can honestly never get sick of a view like this. 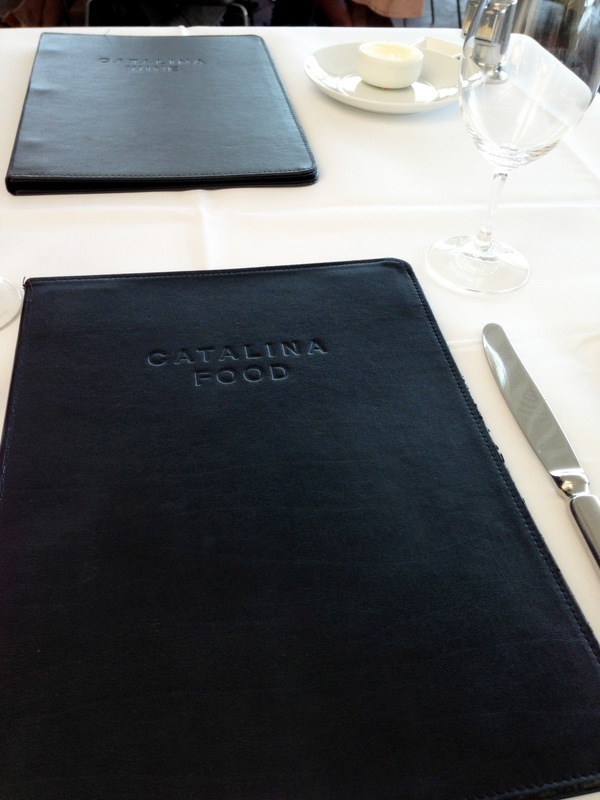 Catalina is quite literally next to the Rose Bay Wharf - so you can get here easily by ferry. For those who prefer to drive, there is also a car park right next to the restaurant. M opted for a Lemonade ($5) which was also nice and chilled. Catalina's signature House smoked salmon with soft boiled duck egg, truffle mayonnaise and brioche ($30) was a visual delight that was worthy of quite a few snapshots at every angle. 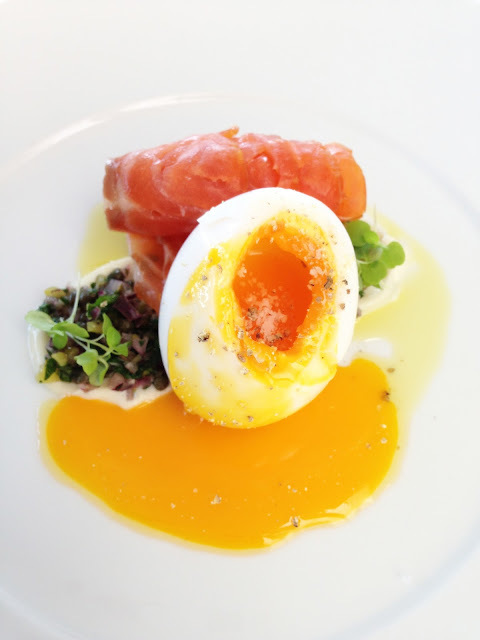 The salmon was wonderfully smoked and the egg yolk oozed gloriously to the plate's perfection. 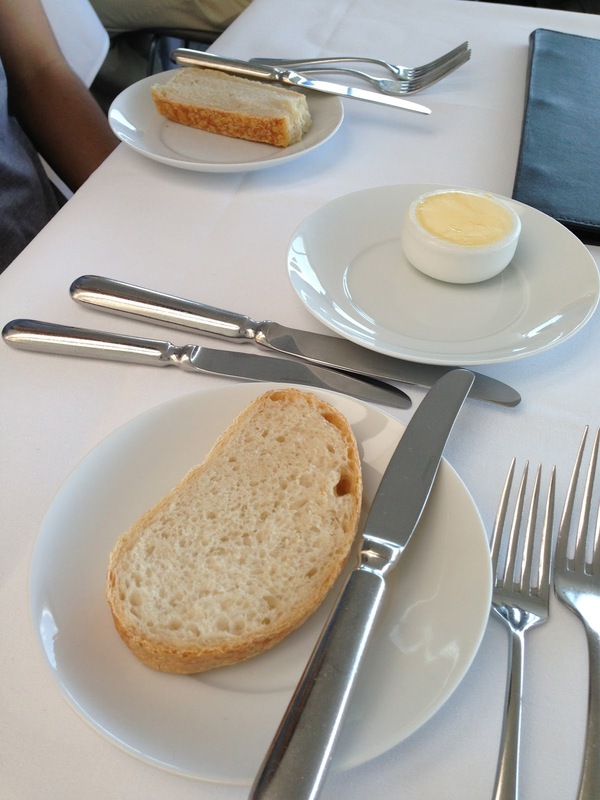 It was a light and refreshing entree, with all the right boxes ticked - to M's satisfaction. M's entree may have won the prize of being most aesthetically pleasing but my Open lasagne of Moreton Bay bugs and avruga ($35) definitely scored the title of "most impressive dish of the day" and also the most tasty! The pool of broth was simply to die for - fragrant from the herbs and with the perfect amount of creaminess, the bugs absorbed all the flavours straight through. The thin lasagne sheets helped add layer and texture to the entree, making each bite a leap to foodporn heaven immediately. A must-order dish! It was definitely tough to follow from the entrees ordered as seen above and so my Pan fried John Dory ($46) sort of paled in comparison. Cooked with tarragon aioli, crushed kipfler potatoes, roast truss tomatoes and asparagus, the outer skin of the fish was golden brown and mighty crispy but it could've been more tender overall. I loved the mini chunks of kipfler pototes (hidden under the fish) as they were marinated with herbs and was a nice little side to go with the dory. The green paste didn't look so appetising but was surprisingly rich and creamy - I needed to smear some of this with each bite as the fish by itself, lacked flavour. 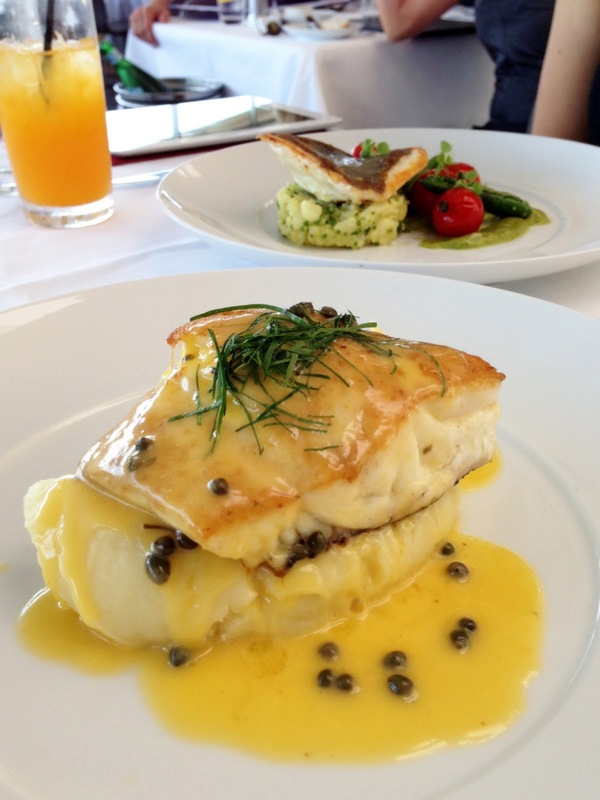 M won the round of mains with his Pan fried snapper fillet with potato and garlic mash; lemon caper butter ($46). It was a creamy and luscious affair as the fish laid gently amidst a bed of irresistable mash with a sauce that was buttery with balanced hints of lemon zest. 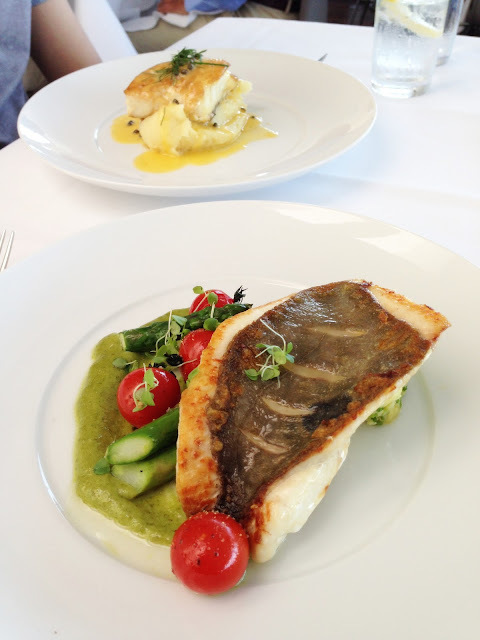 The fish was well-cooked with crispy skin and each bite was accompanied by a pleasant dollop of soft mash - cue clapping! Quite possibly one of the best fish dishes I've tried. 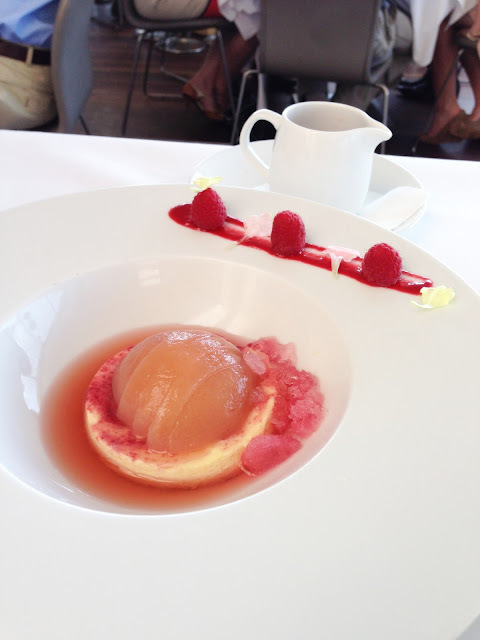 For dessert, we tried the Sauternes poached peach with peach granita and peach melba ice cream ($22). The dessert was pretty in pink and will please those who are lovers of fresh and seasonal fruity flavours. A peach-like sauce was also drizzled gently on top so to further reinforce the hero fruit of the dish. On the whole, M wasn't a fan but I found it to be quite refreshing and sweet. I enjoyed the ice cream the most as it was ultra creamy and yum! Now, the Millefeuille of chocolate marquise and hazelnut dacquoise with white chocolate ice cream ($20) was probably the best dessert choice we have ever made. Oh and also the best chocolate dessert we've ever had. Yes these titles given are well-deserved. Trust me. It's essentially a mini mountain of joy where you'll find rich mousse-like choc lava sitting in between crunchy layers of cocoa-like pastry. Not only did this structure tone down the sweetness, it also made it more texturally fun. 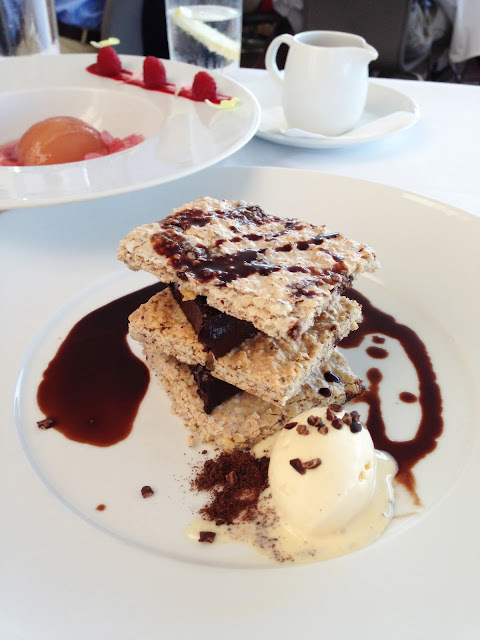 To sum up, the dessert was sweet, decadent, seductive and everything that a chocolate dessert ought to be. Fabulous. Catalina's interiors are simple and classic - then again with a view like that, obviously no extra complications are needed in the decor! 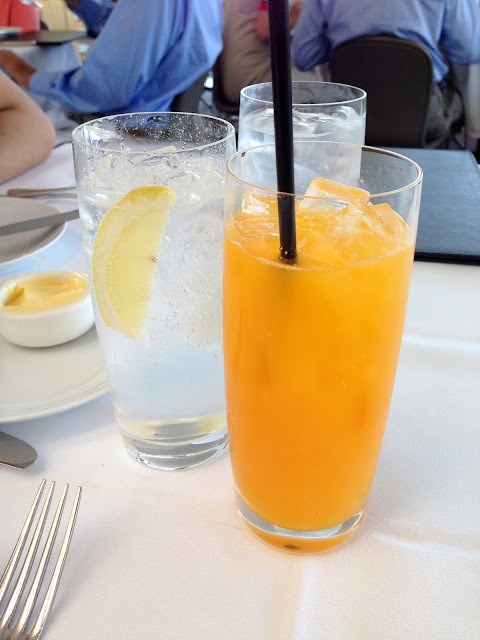 The restaurant is lovely and bright as you walk in (from all those amazing glass windows) and if the weather is on your side, your mood will be uplifted in no time for sure.